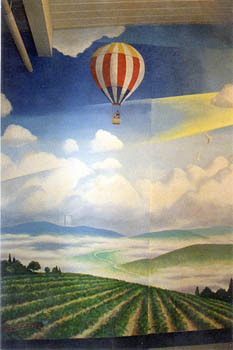 Client: Mural to brighten atmosphere in day room in extented care unit of Sequoia Hospital. Compositon of landscape enlarge the horizon, giving the feeling of space in room. Location: Sequoia Hospital. Day room in extended care unit. Redwood City, CA. Specifics: 45' x 18'. Acrylics.